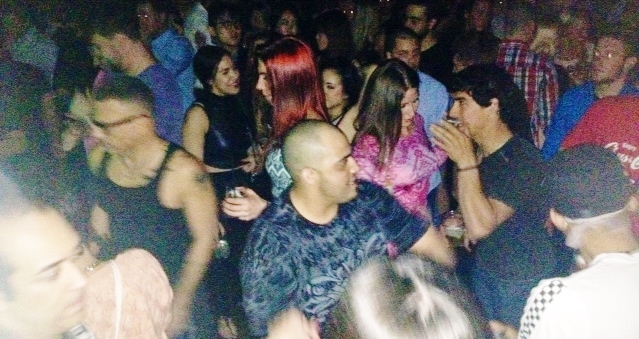 Friday night the dance floor at Bijou Boston was as full as can be, shoulder to shoulder with people who expected to be upraised, stupefied, taken on a journey. They were not disappointed. The two Madrilenos, who often DJ for Boston fans, dropped one of the most adventuresome sets I have ever heard them do. For two hours Chus Esteban and Pablo Ceballos sculpted techno to octopus shape : a bulbous heart, soft but deep, extending eight separate tentacles of texture, talk, and tone — ear candy sweet and salty. within this underwater-ish world screamy high voices buoyed dancers upward; boomy bottoms had them strutting. The two DJs are known for their “Iberican” sound, a kind of psychedelic-effected tribal rhythm, but that phase of their work has ended, and today Chus and Ceballos ply the much solider, massive structures we hear as techno. Where formerly their break pauses featured long jets of wind noise, today they favor edgier streaks — flashes of meteoric. All of this pinged and immersed the Bijou dancers, and all of it they loved. We are accustomed to see Chus playing solo, then Ceballos, and only a few minutes of duet; but on Friday they played duet almost all night long. Thus they were able constantly to inject crazy voices into complex beat progressions, top them with sound effects, and mix humor with boot stomp, or sarcasm with reverb; and to cover emcee monologues with layers of this and that. Especially catchy was their re-mix of the Get Along Gang’s “This Is My Bassline” — a punky monologue reminiscent of Ya kid K almost 25 years ago, but set in an entirely new ring of rhythm and atmosphere. Somehow their sound, despite its size and heft, felt as sultry and lush as did their slinky Iberican of ten years ago. Credit the quickness of their mix cuts, catapulting through glimmer effects first, across screams next, underlining a quote from old house music. They took the music from rolling thunder to stomp and whisper, and the dancers went with them. Stroll strong, bounce big. Like every DJ in sight, they sampled Ramon Tapia’s “Beats Knockin.”; but unlike any other DJ, they shapeshifted it to say “boots lickin’.” Everybody loved it. Their own “Lambestic,” “Reflections,” “Check Tech,” “Partenza”, and “Shakewerk” confirmed their move — begun three years ago — into the heart of techno; they also dropped a couple minutes of “Addicted To Drums” — though nothing else from their Iberican past. Only in the finale of their set did they display a Chus & Ceballos signature : the fireworks finish, in which everything dropped during the body of their set reappeared all at once in a complexity more like ten octopuses than one. The dancers loved it. Providence-born, but now world-wide, DJ Gino Santos opened strongly in the new Chus & Ceballos style, playing a bluesy 122 bpm and featuring many tracks that fans will want to grab onto. Best of these was Gel Abril’s “Changing steps” — techno as it should be. 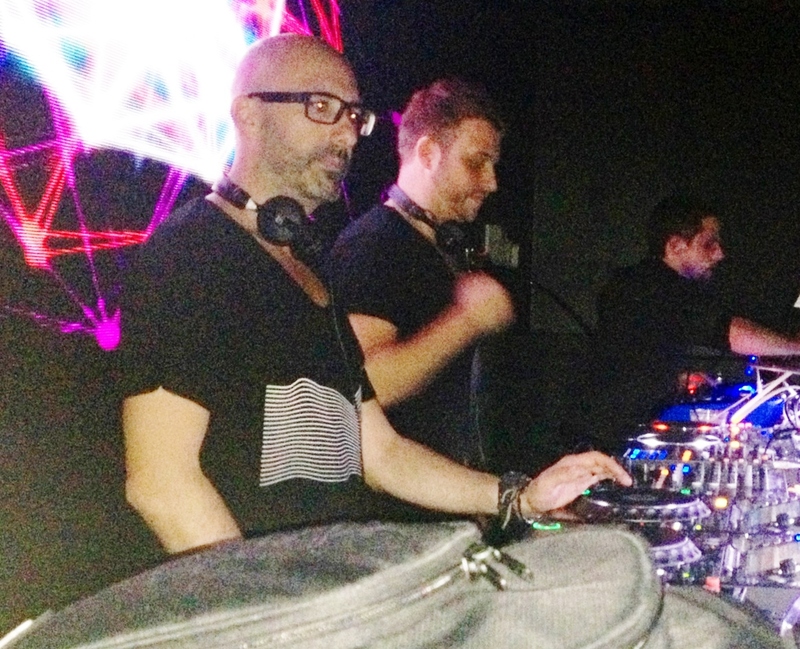 We definitely felt the music in Chus & Ceballos’s April 11th Bijou Boston set.